The Sinn Féin MP Elisha McCallion has said key services have now been restored to communities affected by this week’s bomb alerts. She welcomed the return to normal service after a meeting with the cross-statutory and multi-sector Unity of Purpose Group with various statutory agencies on Wednesday. “There is a huge degree of anger and frustration at the bomb attack in Bishop Street at the weekend followed by a series of alerts which caused so much disruption and upset to the people of this city. “This was compounded by the fact that a number of key services including transport, postal and housing maintenance were suspended due to the threats, causing more hardship to local communities. “Therefore, I welcome that the statutory agencies were today able to confirm that all services have now been restored. That will be some relief to those families and residents who have borne the brunt of the disruption over recent days," she said. The Foyle MP also urged people to come along to a Peace Rally on Friday, January 25, at 1 p.m. in the Peace Garden, Foyle Street, that has been called by the NIPSA trade union. “This event has been organised by the trade union NIPSA and I would urge the people of Derry to come along and show their opposition to those behind the recent mindless attacks and disruption. 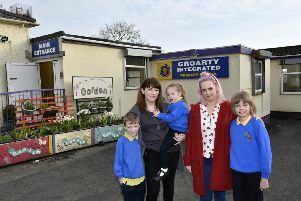 “This is an opportunity to demonstrate the positivity, the support and the solidarity that is the real story of Derry – a city that is moving forward and won’t be held back by anyone," said Mrs. McCallion. Alison Millar, the NIPSA General Secretary, has also urged people to rally at the Peace Garden on Friday. "Please make every effort to attend this rally and show your support for a peaceful and inclusive society for all," she said.